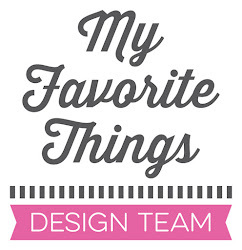 If you joined me for the MFT countdown, you already know that I LOVE the new Sweet Succulents stamp set and Die-namics. It seemed like the perfect set to use for this week's Sketch Challenge. I stamped all the images on a piece of X-Press It card stock and I coloured them with Copics. The images were then cut out with the Sweet Succulents Die-namics. The trio of pots were adhered to the burlap tag with lots of Scor Tape. I finished the card with a simple sentiment tag. The burlap background is ideal for the perfectly colored succulents! The burlap really adds a special touch to this pretty card! Oh I LOVE cutting the burlap in a tag shape!!! lovely! I love the burlap tag! Are the edges stitched to give it such a clean look? I like the burlap with cactus! 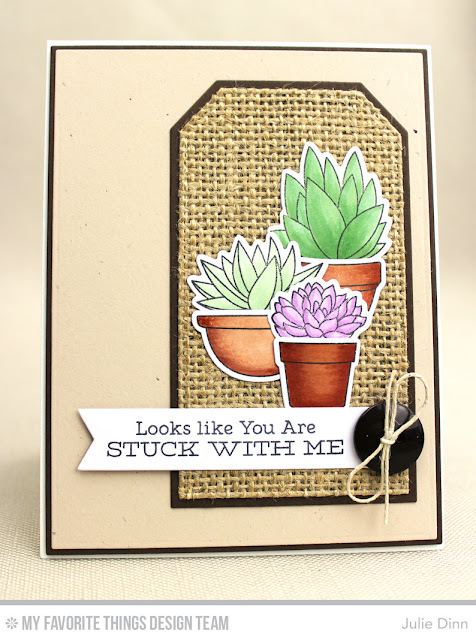 Love that burlap tag, what great texture, and those succulents are such a great new set! Wonderful card. Love the burlap tag... it adds really nice texture, especially with the succulents! Cheers. Great design. Love the burlap accent with the succulents. Cute card! Really like the burlap tag!! Love the burlap, it adds that touch of "nature" that goes so well with the plants. Love this, the use of the burlap is a great touch!! Those Sweet Succulents look right at home against the burlap tag .... great design idea! I love how you use burlap as part of the card. I really love this stamp set. Beautiful card, I love the texture the burlap added! Cute! Love the use of the burlap on here! The burlap is such a great touch. Fabulous card! The burlap is a great touch, especially with the cacti. Fantastic! Looks like that burlap caught my eye, same as many others who posted before me! I like how you layered it on a tag cut, and then layered the succulents. Great card! Oooh, love the burlap. So homey. wow what an impact the burlap makes with this great succulent set! Love the card. Looks so crisp and neat. The coloring on the plants is great. Love the texture of the burlap. Great card! I love the burlap and fun sentiment! Beautifully colored! i love the texture on this card. Julie the burlap is such an awesome backing to the succulents! The burlap tag is absolutely wonderful! Love the burlap, the texture is a wonderful compliment to the subject matter. Love the texture that the burlap tag adds. Very lovely card. Love the colours and the burlap on the tag! The pots look great against the burlap tag. Love the use of burlap, it adds great texture to the card! I love your card! Succulents are special to me because we used over a hundred of them to decorate the tables at my wedding and give as favors, so I would love to have this set. Your succulents are beautifully colored and look great against the burlap. Genius idea! So pretty, Julie. The burlap really sets it off. Pretty card Julie. Love the touch of burlap, goes so well with the cactus!! So cool! Love the burlap! I love the burlap, such fun texture, great card!!! The burlap is a great touch! Adorable card! Great card! I'm loving that cactus set.